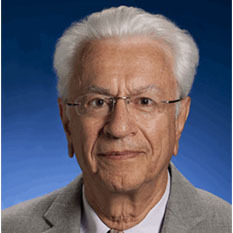 Stamatios Krimigis was elected in 2004 to the Chair of “Science of Space” in the Academy of Athens, and has served as Greece’s Alternate Head Delegate to the ESA Council (12/06-09/10). He served as Chair of the National Council of Research and Technology of Greece (9/2010 - 12/2013). He has been Head of the Space Department (01/1991-04/2004) of the Johns Hopkins University Applied Physics Laboratory (JHU/APL), and Emeritus Head and Principal Staff Scientist since then. He had also served as Chief Scientist (1980-1990), and Supervisor for Space Physics and Instrumentation (1968-79). As Head of the Space Department, he directed the activities of about 600 scientists, engineers, and other technical and supporting staff. The Space Department's principal areas of work include the design, construction, test, and launch into space of entire satellites, and of scientific instruments that perform measurements on a large variety of earth-orbiting and interplanetary missions. The Department has combined excellence in space engineering together with in-depth science capability in designing and executing some 63-satellite missions and well over 175 instruments since 1959 with sponsorship by NASA and other government agencies. After stepping down as Department Head in 2004 he resumed his science work full time. Dr. Krimigis graduated from the Gymnasium of Chios, Greece, the University of Minnesota (B. Phys., 1961) and the University of Iowa (M.S., 1963; Ph.D., 1965, both in physics). As a student of J. A. Van Allen and later on the Physics and Astronomy Dept. faculty, he built instruments for Mariners 3, 4 (Mars), Injun 4, 5 (Earth), OGO-4 (Earth), Mariner-5 (Venus), and Explorers 33 and 35 (Moon, Anchored IMP). He joined JHU/APL in 1968. Dr. Krimigis' research interests include the Earth's environment, its magnetosphere, the sun, the interplanetary medium, and the magnetospheres of the planets. As Principal Investigator or Co-Investigator, he has designed, built, flown and analyzed data from 21 instruments on NASA/ESA space science missions, including the Low Energy Charged Particle (LECP) Experiment on Voyagers 1 and 2, and the Active Magnetospheric Particle Tracer Explorers (AMPTE), a collaborative U.S.-German-U.K. program that created the first artificial comet in space on December 27, 1984. Together with five other scientists, he was invited to the White House for lunch to brief President Reagan on both of these projects on March 26, 1986. He was one of the Group of American intellectuals from World of Arts, Sciences, and Politics invited to meet with President Gorbachev during his first visit to Washington, D.C. in December 1987. He also participated in a briefing of President Bush in the Oval Office on July 7, 1990, following the successful Voyager encounter with Neptune. He is currently a Principal Investigator on Voyager, and the Cassini/Huygens mission to Saturn and Titan, a Co-Investigator on the Ulysses, ACE and MESSENGER missions and Collaborating scientist on the New Horizons mission to Pluto and the Kuiper belt. He is currently Co-investigator on the ESA Proba-3 ASPIICS instrument and the JUICE mission to Jupiter, and the NASA Solar Probe Plus EPI-Lo experiment. Dr. Krimigis spearheaded the establishment of NASA's Discovery program for low-cost planetary missions. The first such mission, NEAR, was developed at APL, launched in 1996, orbited asteroid Eros for a year, and landed on February 12, 2001. The NEAR team has been the recipient of numerous prestigious awards, including the Smithsonian Air and Space Museum Trophy for Achievement in 2001. Together with two other colleagues, he was recognized for"Laurels" in Space for the NEAR achievement by Aviation Week & Space Technology magazine in 1997, and again in 2001. He was also recognized in 2001 with “Laurels” for his role in resurrecting the mission to Pluto, New Horizons, launched on January 19, 2006. He was member of the teams that were awarded the Smithsonian Collier Trophy for Voyager (1980) and the Air and Space Museum Trophy for NASA’s missions Voyager (1989), and Cassini (2012). Dr. Krimigis has built instruments that have flown to all eight planets, the only scientist to do so, and his work on the New Horizons mission to Pluto (the ninth planet until 2007) will complete the set in 2015. Dr. Krimigis has published more than 560 papers (30 in Science, 10 in Nature) in journals and books, is co-editor of the book Saturn from Cassini-Huygens (Springer, 2009); has been awarded the NASA Medal for Exceptional Scientific Achievement in 1981 and again in 1986, over forty NASA Group Achievement Awards for Voyager, AMPTE, Galileo, NEAR, Cassini, MESSENGER, ACE, etc, the ESA group awards for Ulysses and Cassini-Huygens, has been a member of the National Academy of Sciences' Space Science Board, Chairman of the Board's Committee on Solar and Space Physics (1983-1986), member of NASA's Space Science and Applications Advisory Committee, Fellow of the American Geophysical Union (AGU), the American Physical Society APS), the American Association for the Advancement of Science (AAAS), the American Institute of Aeronautics and Astronautics (AIAA), and Trustee and Chair of Basic Sciences section of the International Academy of Astronautics (IAA). He received the IAA Basic Sciences Award in 1994. At the World Space Congress (2002) he was presented with the COSPAR Space Science Award, and in November 2004 he received the Johns Hopkins Applied Physics Laboratory Lifetime Achievement Award. He has participated as member or Chairman in many national and international conferences in space science and space systems management, and has lectured in major conferences and National Academies in all five continents. The International Astronomical Union in 1999 named asteroid "8323 Krimigis" (previously 1979 UH) in his honor. The President of the Hellenic Republic has awarded him the Gold Cross "Commandeur de l' Ordre du Phoénix" in 1997. He was awarded Honorary Doctorates from the University of the Aegean (12/2009, Financial and Management Engineering), the University of Athens (05/2010 Department of Physics), the Hellenic International University (5/19/11, Science of Engineering), and the 2013 Alumni Fellow from the University of Iowa. The Council of European Aerospace Societies awarded Dr. Krimigis its 2010 CEAS Gold Medal. On September 2012 he received the 2012 IAA Laurels Award for Team Achievement to leading NASA’S MESSENGER mission to Mercury. The European Geosciences Union awarded him the Jean Dominique Cassini Medal, and the AIAA the James A. Van Allen Space Environments Award, both for 2014.